Well, I feel like I've been MIA from my computer lately. I volunteered to bring popcorn for the teacher treat during Teacher Appreciation week at my son's school (I'll post when they're done). Of course, I can't just bring a tin of popcorn! The OCD crafter in me has to make it "special" - I think I may have gotten in over my head:-P I found out there are 85 teachers and staff at the grade school and I decided to make bags with Cricut cut toppers for each one. Okay, I have 30 done and I have one more week! Ugh! Well, I did find time to make a sympathy card for one of my mom's friends whose mother passed away. I grabbed my Lyrical Letters cart because I remember seeing someone use it for a sympathy card once. Wow, there were quite a few really nice cuts to make a quick and easy/CAS card. I added a little Midnight Blue Stickles for a simple embellishment. 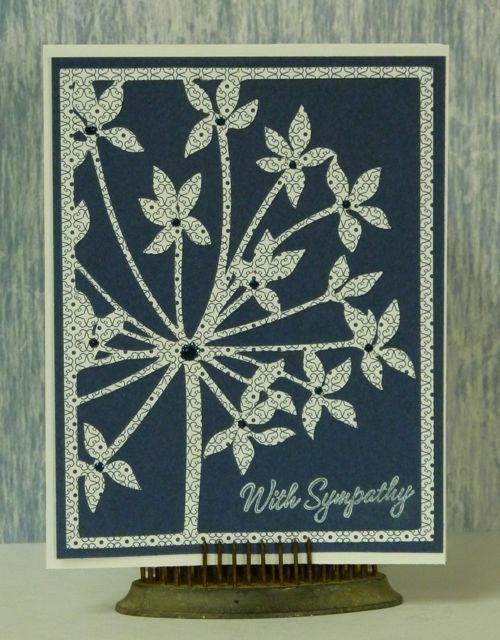 The cardstock, patterned paper, and sentiment is from Stampin' Up. Very elegant CAS card Tammy! Pretty! Thanks for joining our CAS challenge! This is lovely for a sympathy card-very elegant and clean! I will have to remember this cut on LL for the future, as I find sympathy cards the hardest to make! Glad you came to join us at Exploring Cricut this week! Beautiful card and thanks for entering at Exploring Cricut. Fabulous, love the design, very effective...thanks for joining us at Cupcake! Such a cool and clever idea, I need to try this. Thank you for joining us at the Celebrate the Occasion challenge and hope to see you back again.